We recently reported the existence of two versions of Galaxy S5 in our Rumor Roundup. 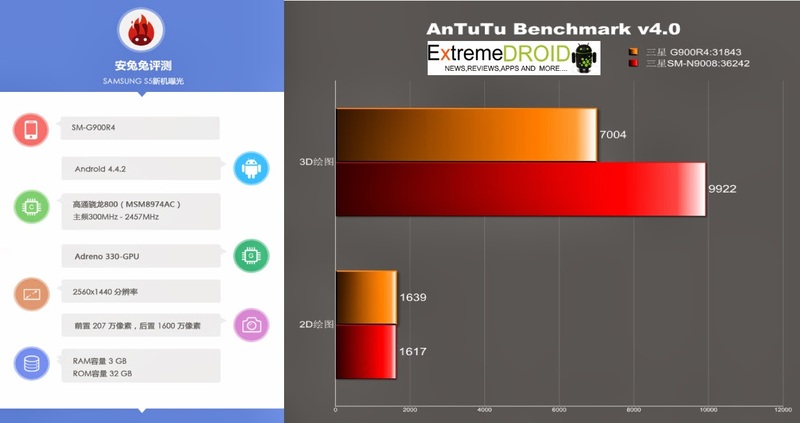 Screenshots of Antutu benchmarks of both the versions are released by the Antutu china,confirming our expectations. The "Premium" version internally known as SM-G900R4 is powered by a a 2.5GHz quad-core Snapdragon 800(MSM 8974AC) CPU Same as the one found in Gionee Elife E7, 3GB RAM, Andreno 330 GPU, 32GB internal storage, 16MP primary camera, 2.1MP front-facing unit, a 1440p QHD display, and will have Kit Kit 4.4.2 Skinned with a new version of TouchWiz. The snapdragon version scores 31843 points on the benchmark,which is actually lower that the scores of Note 3 due to the presence of a QHD display. The "standard" version SM-G900H is powered by Samsung's own Exynos 5422 clocked at 1.5 GHz and features 2GB RAM, ARM Mali-T628 GPU, 16GB internal storage, 16MP camera and a 1080p FHD Display. The exynos version scores 35445 on the benchmarks and beats both the Note 3 and the Snapdragon version.Judging from the low clock speed of exynos 5422 we suspect the chipset is capable of a true octa-core configuration similar to Mediatek MT6592. 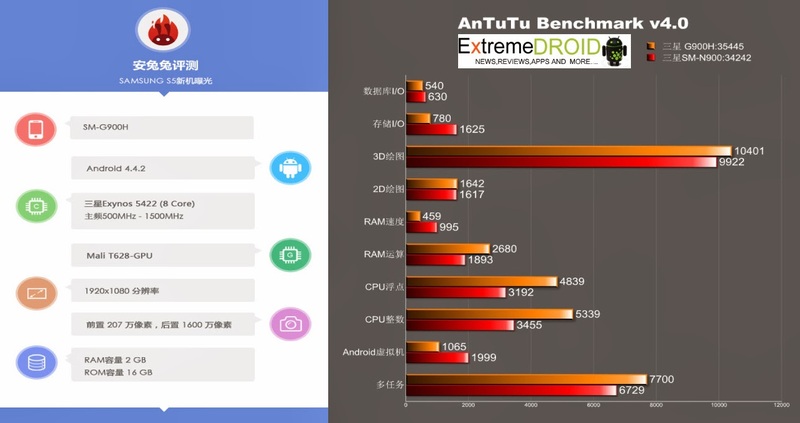 AnTuTu benchmark is known to be overly generous to octa core chipsets ,despite low scores the snapdragon version is much more faster than the one powered by exynos. Both versions of Galaxy S5 will be revealed on 24th Feb at Barcelona,stay tuned for more updates on the device.